I make a prediction about who will win the Physics Nobel Prize every year. I've never been right in the past, so there's no harm to be done in sticking my neck out again this year. 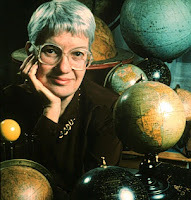 My perennial favorite candidate is Vera Rubin who discovered that most of the material in the universe is mysterious and invisible dark matter. Dr. Rubin made her discovery by measuring velocities of stars as they revolved around the outer edges of galaxies. Most physicists and astronomers expected that the stars far from the center of a galaxy should move slower in their orbits than the ones closer to the middle. Rubin found that isn't that case at all. The outer stars move much faster than they should. There are all kinds of exotic ways to account for this, but the simplest is to accept that galaxies are a lot heavier than we'd assumed based on the stars and other matter we can see. There must be a halo of invisible matter entwined with the normal stuff - or we really have the whole theory of gravity thing messed up. Either way, Dr. Rubin's observations led to one of the most fascinating discoveries to come along in physics in a century. Some of my friends here at the American Physical Society are betting on the people who discovered dark energy (Adam Riess and Saul Perlmutter). It's the mysterious energy that may be making the universe expand at an ever increasing rate, rather than slowing down as most people thought it should. Dark energy and dark matter aren't related (as far as we know) but it would be kind of cool if they both are the subject of this year's Physics Nobel. So I'm gong to go with Rubin, Riess, and Perlmutter as my best guess for the 2008 prize. Personally, I think it's cowardly to hedge your bets by making more than one prediction, but I've heard Dan Schectman and Roger Penrose mentioned by a few people for their work on quasicrystals. Penrose discovered them mathematically, and Shechtman discovered them in the lab. Quasicrystals look a lot like regular crystals except they aren't perfectly identical from one point to the next. The pattern slowly changes, which makes them mathematically fascinating, and potentially very handy in commercial applications. If Rubin weren't still in the running I would like to see Shechtman win in part because of the article I wrote about him a few years ago. I always have a soft spot for the folks I interview. Not to mention, it was an uphill battle for him to get people to believe his discovery was real. Here's an excerpt from the story I wrote back in 2003. "For two years I did not have anybody who believed my results and was usually ridiculed," says Shechtman. "The scandal of polywater was still in the air, and I feared for my scientific and academic career." He deserves the Noble Prize both for his scientific work and for sticking to his guns in the face of a lot of skepticism. I hadn't thought of that, David. LEDs certainly are handy devices, and the Nobel committee has recognized similar technologies many times. We'll see in a few minutes.